To help other builders, please list the boat you are building in the Thread Subject -- and to conserve space, please limit your posting to one thread per boat. Please feel free to use the gallery to display multiple images of your progress. Today I finished my shear legs for raising or lowering the mast. Even that my mast weighs only 11 kg I do not dare to just pick it up walk on deck and put it into the mast hole like Bondo did so fantastic within 60 seconds. I have to pay tribute to my age meaning my balancing is not as good as it was 30 years ago. That is the reason I built these shear legs. 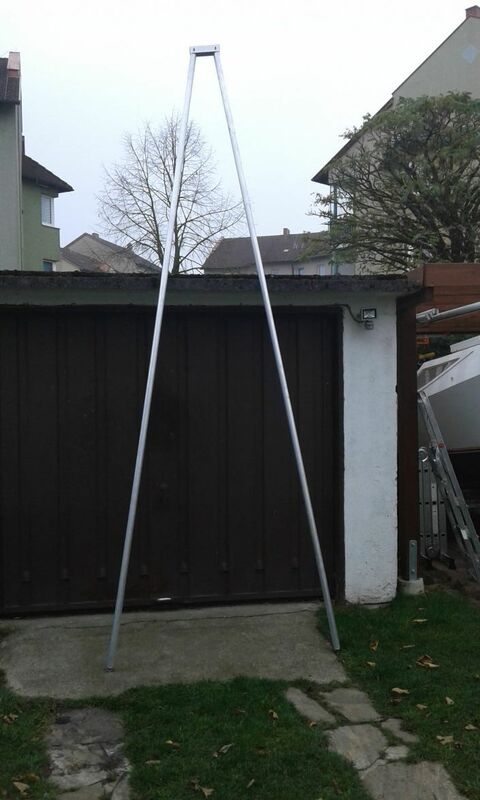 The 2 legs are aluminium pipes 4 meters long and a 2 mm thickness. 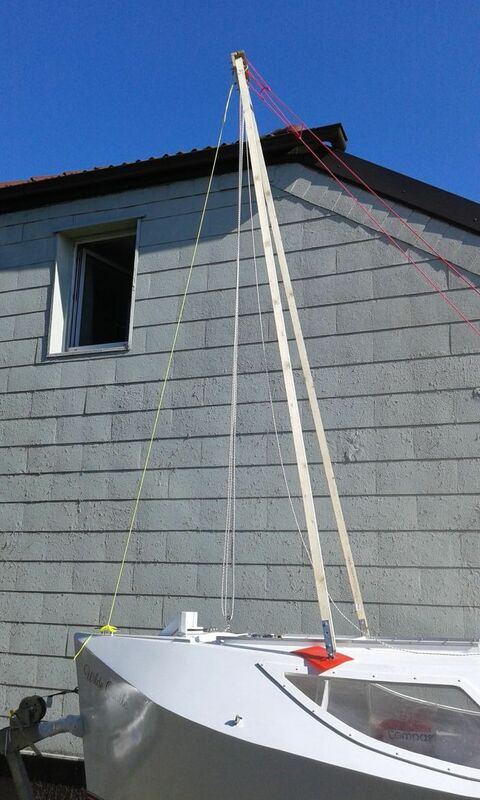 I connected them with a 20 cm long U profile and mounted 4 rings for the fore and 2 back guys and for the purchase with which I can raise or lower single handed my mast. Where are the bottoms of the legs when you are using this? It seems that it's almost as large as the mast so i must be missing something simple. No Jaysen you are not missing anything just my explanations were not detailed enough. 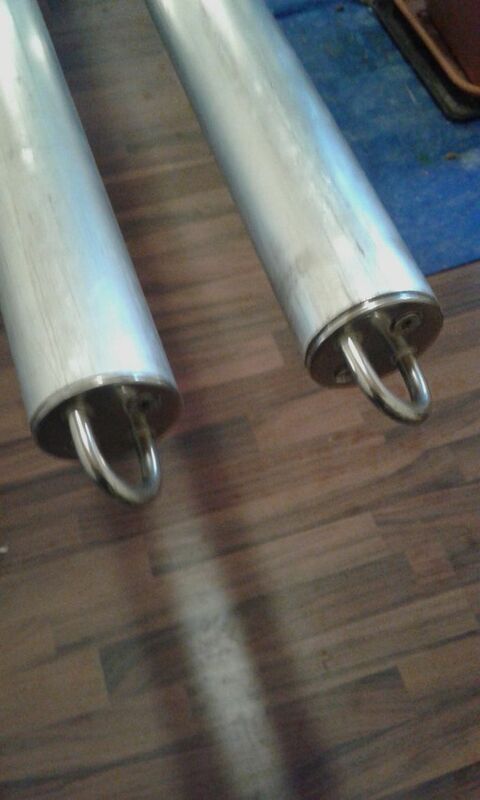 I did not show the bottom of the shear legs which get attached to deck fittings and this is how they look. 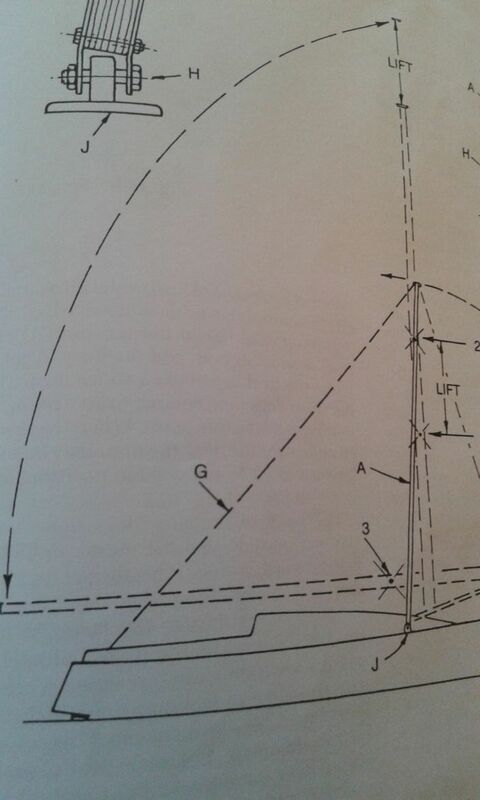 You are right that these things are quite long but it is necessary because my 6,1 meter long aluminium mast has a bury of 1,1 meter which has to be added to the centre of gravity of the mast and then it needs to be slung close to the purchase for raising or lowering. I have tested these exact lengths successfully with my previous wooden spar construction. 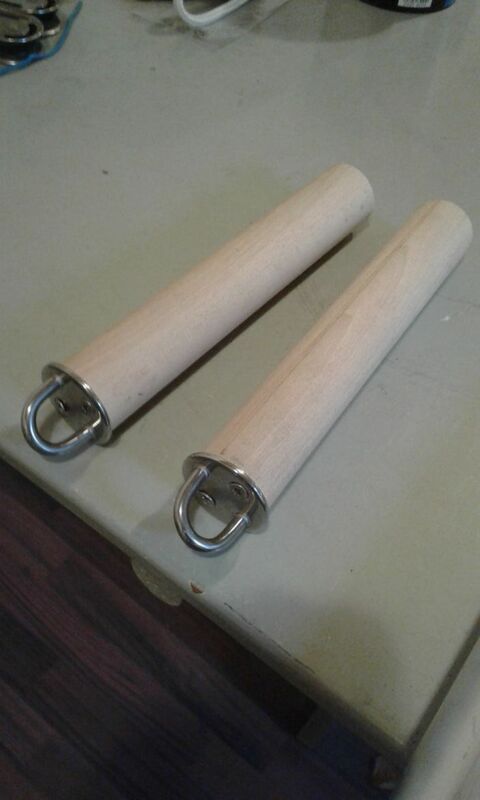 I did make this working wooden shear legs new with aluminium, because it is lighter looks better and my distant plan is that I can raise or lower the mast while on the water for instance to get through under a bridge or like Hasler suggests to use them on a world cruise as an ideal jury rig a situation I will never be in. 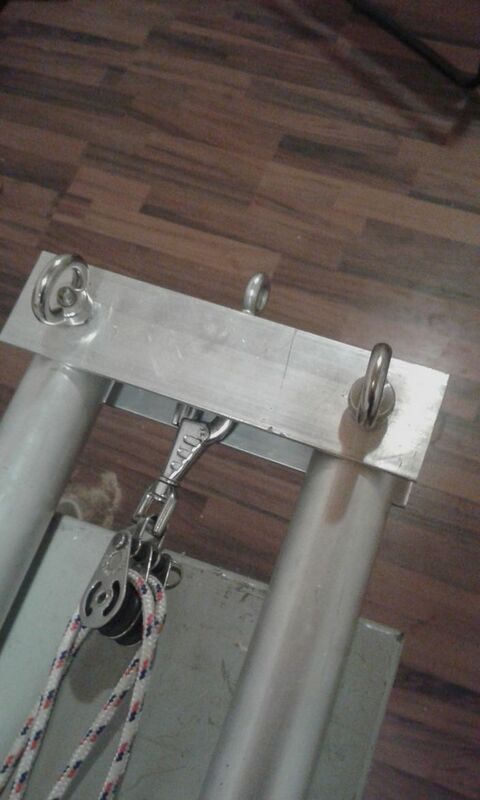 To take the shear legs along on the boat it will be necessary to cut the 4 meter spars in half for storing under the port bunk like boats hook and paddle and when one wants to use them lengthen them again with inserts also from aluminium fitted with 4 screw bolts. Hasler suggests actually to use a derrick like Tony seems to have for his Catalina and he says it is simpler than shear-legs but it needs more care with the guys. This is his example of a derrick. It was not possible for me because the single spar needs to be stepped on a strong coach roof cup and therefore not possible on my AD14 without reinforcing the roof a lot. That is why I decided on this design of HG Hasler. 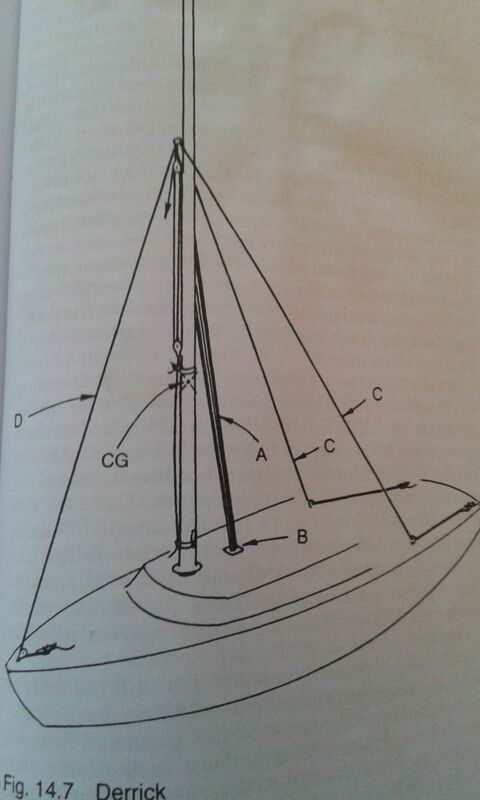 I will not cut my spars in half for the beginning because I plan to carry them on the roof carrier of the car and for raising the mast on the shore only. Should I make the trip to the Netherlands to sail there with all their bridges in the future I can still make these cuts. Tony mentioned that my shear legs look very stout which is true although they weigh only 7 kg including the guys and purchase ropes which is half of the masts weight. The proof of the pudding is in the eating, so I will report next Spring when I use my concoction at the shore of the lake. Thank you Karl. That makes sense to me and seems so obvious in retrospect. Great job. Can’t wait to see it in action! Very interesting stuff, Karl. Maybe you can take a video of this contraption in action? It is very interesting stuff! Very complex! On my father in laws 18 foo Bruce Roberts boat he had it set uo so that he had to cables that ran the the back corners of the boat from the spreader bar on the mast he would hookup the stays on booth sids of the mast that would stop the mast falling off to either side and he has a come along from the same position on that spreader bar and he would use the come along hooked to it and his front stay position to pull the bast uo with. This worked well for at least 17 years that he ran that boat.